Edwin Black's book is enlightening without being at all depressing. No hyperbole or hysterics, but some suspension of disbelief is required. I was expecting a dark tale of gloom and doom, a post-apocalyptic tableau of a born-again, prehistoric oil-free society. After all, Edwin Black is the author of the chillingly revelatory IBM and the Holocaust, a disheartening exposé of America's disgusting attraction to the racist pseudo-science of eugenics, War Against The Weak, and other sobering and impeccably researched investigative works. Surely Black's new book about ending our country's self-destructive addiction to fossil fuels would be brilliant, but dark and deeply depressing. Black states the problem clearly and without hyperbole or hysterics. He then presents a sane and remarkably rational step-by-step scheme for quitting our fossil fuel dependency. Along the way, he cites published, noncontroversial works plus his own primary research, which keeps the proceedings well out of the realm of science fiction, except perhaps for one element (I'll get to that in a bit). 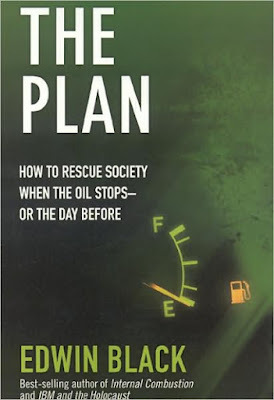 The fact that this unending and expanding thirst for oil is the world's economic and political choke point is no accident, as Black recalls from his previous book, Internal Combustion. Throughout history, fuel has been controlled by political and commercial interests that were, as now, two sides of the same coin. And despite the fact that oil pollutes, affects all other prices and forces us to play nice with interests that are antithetical to our own, a huge socioeconomic infrastructure supports and promotes its perpetuation. But rather than pound the obvious, Black calmly sets the table, then moves on to his recommendations for extricating ourselves from the nightmare. The required actions are all rational and involve the use of existing technologies -- electricity, bio-fuels, hydrogen fuel cells and more. Black lays it out week by week, with each successive step building upon previous ones to move away from the petroleum morass. The auto industry will have to be a large part of the solution. One would consider this a no-brainer with the economy in the dumper right now. Manufacturing and selling gas-free vehicles could revive the industry. But according to Black, automakers that have already developed the technology are reluctant to fully roll out new vehicles to compete with their large stock of unsold gas guzzlers. But the good news is that they would be forced to do so as their business spirals downward. The challenge is to get past the incumbent infrastructure. Between lobbyists, politicians and the public, the addiction to oil is entrenched. That's where The Plan requires some suspension of disbelief. With their profits on the line, we can expect a fierce and concerted campaign of fear, uncertainty, doubt and obfuscation to dissuade the migration from oil. The government, which should be part of the solution, is still a large part of the problem. The EPA, for example, makes conversion of internal combustion engines to alternative fuels more difficult, according to Black. And its determined indifference toward mileage standards has encouraged inefficiency, too. So is Edwin Black's Plan the road map to our future? Maybe, but at worst, it's an excellent point of departure from our current suicidal path. Highly recommended.